Serves: 4 Prep: 10 minutes Cook: 35 minutes. 1. Fill a large pot with enough water to reach a depth of 2 inches and bring to a boil. Add the broccoli and cook for 1 minute; drain and rinse with cold water. 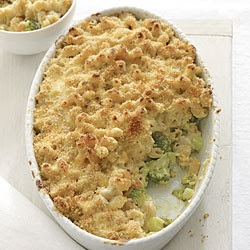 Grease a 9-by-13-inch baking dish and add the broccoli in an even layer. 2. Fill the same pot with salted water and bring to a boil. Add the pasta and cook until al dente; drain. 3. Position a rack in the upper third of the oven and preheat to 400°. In the same pot, melt 2 tablespoons butter over medium heat. Add the shallots and cook, stirring, until softened, 3 to 4 minutes. Stir in the flour for 1 minute. Whisk in 1 cup milk until thickened, then whisk in 1 cup more. Whisk the cornstarch into the remaining 1 1/2 cups milk, then whisk the mixture into the pot. Simmer, whisking, until the sauce thickens, 2 to 3 minutes. Lower the heat and stir in the cheddar and 4 tablespoons parmesan. Season with salt and pepper, then stir in the pasta. Spoon the mixture over the broccoli. 4. In a small heatproof bowl, combine the garlic and remaining 1/2 tablespoon butter; microwave at high power until melted, about 20 seconds. Stir in the bread crumbs, the remaining 2 tablespoons parmesan and 1/4 teaspoon each salt and pepper. Discard the garlic, then sprinkle the bread crumb mixture on the pasta. Bake until golden, about 15 minutes. Let cool slightly before serving.